April 15 marks the opening of haddock season. We will be expecting reports of good ground fishing in the coming weeks based off the reports of boats heading out for redfish. Salmon fishing is picking up as more ice melts off of salmon lakes throughout New England. Trout stocking has been taking place in many southern New Hampshire and Maine waters that are open, bringing many anglers out of hibernation. Greg at Jordan’s Store in Sebago told us that there were quite a few boats out over the weekend, but the smelt runs are just beginning, which usually drives the early salmon bite. He says anglers who put their time in are seeing results, but he expects the fishing on Sebago to improve daily. Many of Greg’s reports are coming from the area in front of the mouth of the Songo River. 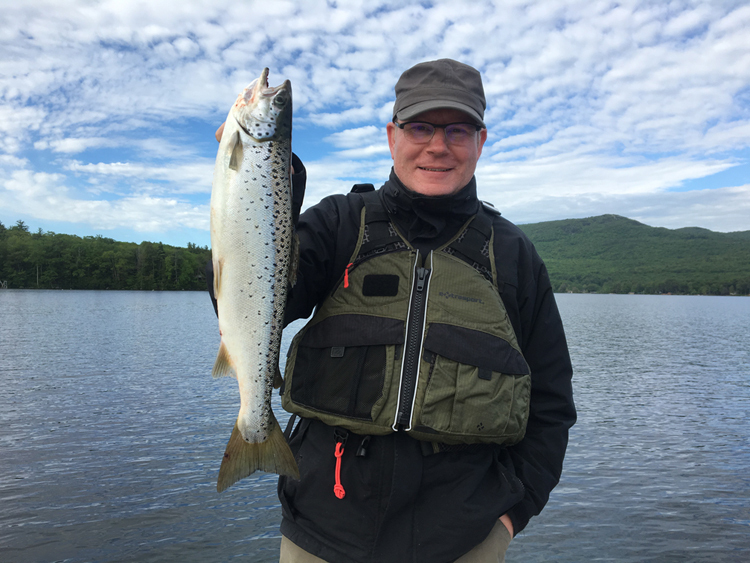 In Naples, Dave Garcia of Naples Bait and Tackle tells us that the reports he is getting from Sebago are that the lake trout fishing has been very good for numbers of fish. Dave tells us that the Songo River area is producing some salmon, but he too expects the bite to pick up with warmer water temps and better smelt runs. Spring salmon fishing is some of the most productive of the year. Photo courtesy of Tim Moore Outdoors. Full-time New Hampshire fishing guide Tim from Tim Moore Outdoors tells us that while there is still quite a bit of ice on Lake Winnipesaukee, many anglers are finding some small areas of open water to fish. “The salmon bite should really pick up any day now that the smelt runs are beginning. We won’t put the boat in until ice-out has been declared and we won’t have to compete for as much real estate,” Tim said. Until then he will be busy getting his boat cleaned up and ready for the upcoming salmon season. Felix at Suds N’ Soda Sports in Greenland reports a lot of people buying bass lures and worms, he assumes for local trout rivers that have been stocked. “I haven’t heard of anything specific being stocked with trout, just rumors, but the stocking trucks have been seen in the area,” he said. In Meredith, Alan from A.J.’s Bait and Tackle said that more areas are opening up and anglers are taking advantage to catch salmon as well as some very nice rainbow trout, as big as five-pounds. He says that some anglers are able to get smaller boats in areas such as Alton Bay, but there isn’t a ton of open water. Alan says that the best reports he is receiving so far are coming from the Weirs channel. Chad at Dover Marine/Covered Bridge Sports tells us that things are still slow overall, but he did say that Willand Pond has been stocked with rainbow trout and anglers have been picking away at them. He also told us that bass fishing in local ponds, such as Willand, Swains, Baxter, and the Bellamy Reservoir have been on the slow side, but bigger bass are starting to move into the shallows. Eastman’s Fleet has been running redfish trips while waiting for haddock season to open. “Out today (Saturday). Yesterday (Friday) we had three boats out and it was a complete massacre. Fifty plus jumbo Reds (pp), and glad to report our only problem was too many haddock to struggle through. Pete Santini at Fishin’ Finatics said that the trout fishing was still very good at Horn Pond in Woburn, Walden and White’s Ponds in Concord, and Jamaica Pond. Power Eggs, meal worms, and salmon eggs are still getting it done right now. Pete tells us that the holdover striped bass are becoming more active in front of the Amelia Earhart Dam. Anglers are trolling tube and worms and throwing small rubber shads. He hasn’t had any flounder reports yet.